Rich chocolate syrup, chips, fudge, caramel added to the perfect brownie results in an ultra rich, moist and chewy brownie that chocolate lovers will enjoy. The luxuriously deep flavor and smooth texture of Ghirardelli Premium Chocolate is the secret to pure brownie perfection. Indulge in this ultra rich, moist and chewy brownie, and experience moments of timeless pleasure with Ghirardelli. About Ghirardelli: When Domingo Ghirardelli, the adventurous son of a celebrated Italian confectioner, set up shop in San Francisco during the gold rush, he created some of the finest chocolate Americans had ever tasted. Today, after over 150 years of passionate chocolate making, that same spirit has inspired what are arguably the world's best brownie mixes. They're everything a baked treat should be. And then some. 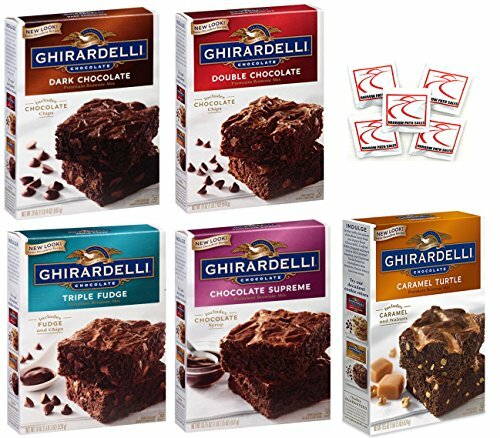 Ghirardelli Brownie Mixes. Food Gift Basket: A reliable, great tasting food gift for holidays, birthdays, or housewarming gifts too. If you have any questions about this product by Narrow Path Sales, contact us by completing and submitting the form below. If you are looking for a specif part number, please include it with your message.